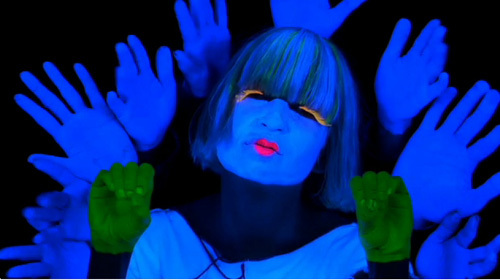 sia + claire carre: soon we’ll be found. Like a lot of people, I discovered Sia during the last six minutes of Six Feet Under’s finale episode – “Everyone’s Waiting”. I feel no shame in saying that I wept like a baby when I first saw this. People talked about it for months, watched it repeatedly, cried again, but more than anything people talked about the song – “Breathe Me” – that pushed that amazing closing sequence over the top. It’s become almost ubiquitous now and I’ve seen/heard it all over the place, but luckily for us Sia isn’t a one trick pony. Displaying an almost Björk-like fearlesness in her video new video for “Soon We’ll Be Found”, Sia and director Claire Carre create an entire universe with the magic capable of the human hand. From sign language to shadow puppetry to ultraviolet illusion, this video is a gorgeous, trippy day-glow romp. « s+c interviews: liz wolfe.